This bulding has been replaced by a skeleton tower. 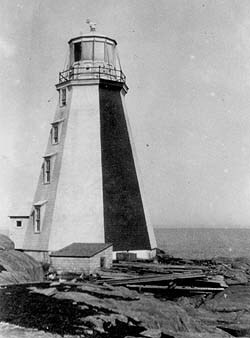 The lighthouse was originally an octagonal wood tower, 45 feet high, painted white, with black stripes to seaward. Between 1962 and 1965 it was replaced by a skeleton tower, with an enclosed stairwell. Sources: Personal memories; Research files, Maritime Museum of the Atlantic. In 1870, in a heavy storm, the keeper's house was struck by a sea which swept right across the island. The house was washed from its foundations and deposited 150 feet away. The keeper and his family escaped into the light tower just in time. All the fences and other buildings were destroyed and about 100 feet of the boat slip was carried away. The lighthouse was repaired so the keeper and his family could live in it and secured with wire stays and anchors. The house was later repaired. As told by James Kidson. This photo was taken in the Spring of 1935 or '36 by Ruth Kidson, my mother. Warren Kidson, my father had rowed Mom, my two brothers Ralph and Robert, and me out for a run in our double-ender work boat. It was a beautiful Spring morning, the ocean was as still as a mill-pond. Mom took the picture from just east of the North Gully where we went in to land out boats at the slip-way which you can see in the picture. Our motor-boat is up on the slip-way in front of the boat house. We kept a dory, nets, barrels of bait, trawls and coal for house fuel in the boat house. Later one year the seas came and washed it up onto the slip beside it, and it broke in two and we lost everything - boats, nets, traps, coal, gear, etc. That time it was several weeks before we got a passing ship to stop and give the word that we were marooned there. 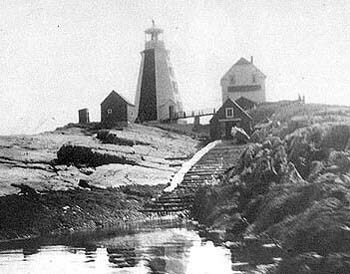 During the storms, a few times the seas went roaring right up between the dwelling house and the lighthouse, but there was a bridge from the house to the lighthouse so that the lightkeepers could get to the lighthouse to wind up the weights that turned the light up in the lantern. It used to take about four hours for the weights to go to the bottom of the weight shaft. The lighthouse was four stories high, plus the lantern. The light was a kerosene lamp under pressure with a mantle. The lamp was in the center of a twin dual bulls' eye enclosure made up of glass prisms which greatly amplified the two beams of light that shone out from the opposite sides. The two rays of light would show as two flashes about 10 seconds apart every minute or thereabouts. These flashes were visible up to 22 miles from the light. The lantern was approximately 80 feet above sea level. The dwelling house was a two storey building and had a kitchen, living-room, and four bedrooms. There was a cistern in the basement where water was caught from roof gutters and down-spouts. In the summer it was very poor for drinking. The building between the house and boat-house was a hen-house where we kept hens for eggs and chicken to eat. We moved in to stay on the land at the old Bowser place about 1938. My step-grandfather, Samuel O Webber, was lightkeeper and my father, Warren Kidson was his Assistant. They got $80.00 per month between them. Unfortunately my father has passed away and I can only remember bits and pieces of stories he used to tell about living on Egg Island. I have been trying to get some stories out of my uncles - but they were younger and don't remember as much. In 1961, all but 15 feet of the old tower was destroyed by fire. It was replaced by a steel skeleton tower. The tower was automated at some time before 1973. It is now unwatched. 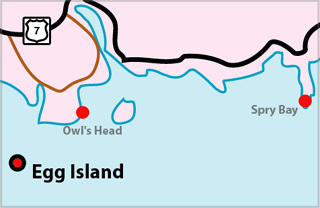 On Egg Island, a small rocky island off the east side of the entrance to Clam Bay, Eastern Shore, Nova Scotia. Tower Height: 045ft feet high. Light Height: 082ft feet above water level.